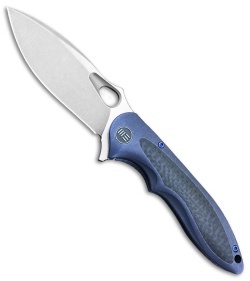 This Zephyr model sports a stonewashed blade and a blue anodized titanium handle with carbon fiber inlays. The WE Knife Co. Zephyr is an ergonomic folder that comes dressed to impress, but don't let its good looks fool you—this knife is an EDC powerhouse. 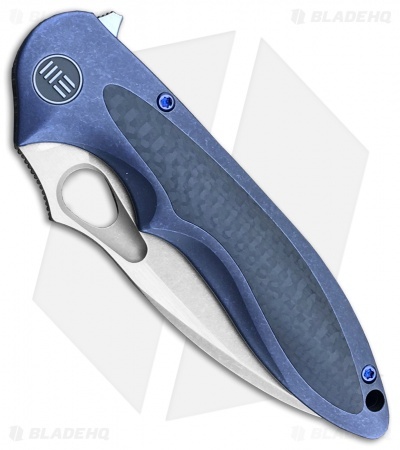 Its resilient Bohler M390 blade offers a generous bellied edge, and accommodates easy ambidextrous use with a thumb hole and flipper tab opener. The Zephyr's precision machined titanium frame lock handle is contoured for a comfortable and secure grip. Bohler M390 blade provides excellent edge retention and wear resistance. 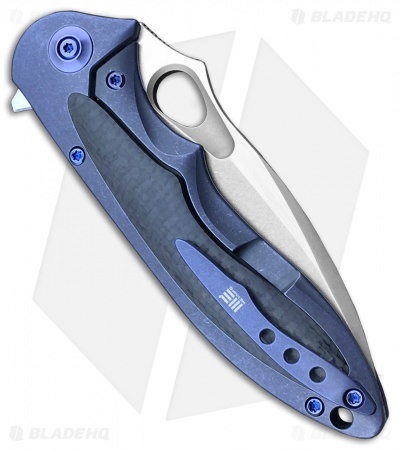 Ceramic ball bearing pivot offers smooth, effortless blade deployment via thumb hole or flipper. A machined titanium pocket clip allows secure everyday carry.